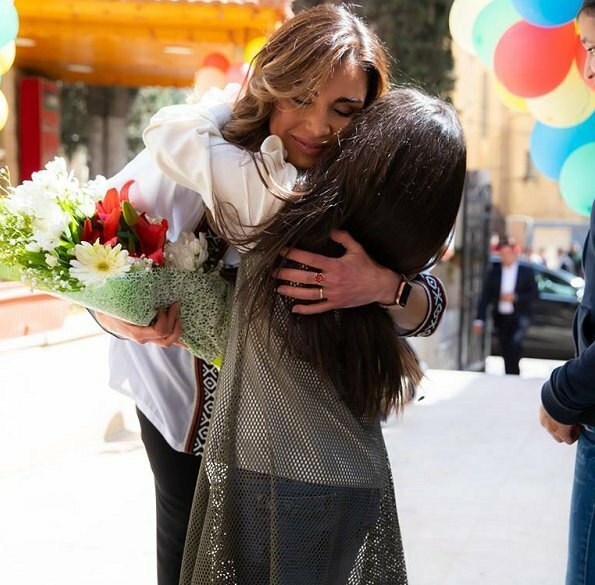 Queen Rania of Jordan visited Al Hussein Social Foundation for Orphans in Ashrafieh. There, The Queen met with orphaned children and their caregivers for a celebration which marks Mother’s Day. During the visit, The Queen also met with a group of widowed and adoptive mothers and their children, each of whom have received educational scholarships from Al-Aman Fund for the Future of Orphans. An initiative of the Queen Rania Foundation for Education and Development (QRF), Al-Aman Fund was established in 2003. The Fund aims to provide orphans and children of widowed parents with opportunities to obtain university and higher education degrees, attend community college, or receive vocational training. Fabulous! Lovely simple outfit too. Agree. She always looks very charming. Fantastic, she is always at her best when wearing ethnic inspired outfits. Very lovely blouse and her hair looks great.